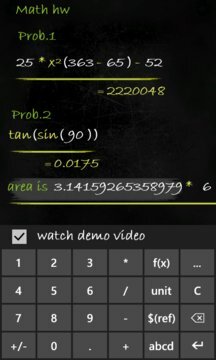 A calculator with an exciting user experience inspired by the old school blackboard that allows you to work with grids & export your results to a spreadsheet! Thanks to its export to Excel™ function (works best with grids), Smartboard Calculator can also be the birth place of every homework. 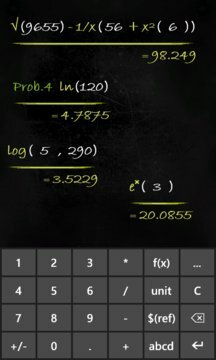 Plus, no calculation you write is ever lost – with the app’s history log you can refer back to any expression you wrote earlier. To be sure you never lose this data, you can also backup all your app history to SkyDrive and restore it if you need to.